There was a lot of chatter in the book community a couple of weeks ago over an announcement that Len Riggio, Chairman of Barnes & Noble, made about his interest in buying back his company. Riggio has done this more than once since he first purchased the company back in 1971. But what I’ve found most interesting about the announcement is a detail I haven’t seen anyone else mention. It’s what Mr. Riggio doesn’t want to include in the deal. In what he doesn’t want, everyone seems focused on his exclusion of the nook platform, but what’s of much greater interest to me is the other thing he doesn’t want, the college bookstore division. Now in thinking about this, let’s review specifically just what we’re talking about. Barnes and Noble currently has about 689 “regular” bookstores, but it also runs 674 college bookstores. Note that it doesn’t own 674 college stores, it manages them and in most cases the building the store is located in is part of the college or university, usually right on campus. Typically, Barnes and Noble won the concession in a bidding process from the home institutions, like Pepsi did at the stadium, and now it has exclusive rights to sell textbooks and t-shirts on the campuses of those institutions. If you’re talking about a large institution with a successful and popular sports program, like the one I work for here at Penn State, then the t-shirt piece of that can be as lucrative as the bookstore/textbook piece of it, probably more so, and it is very unlikely that we’re going to see that change anytime soon. But there’s one thing Len Riggio correctly identified a couple of years ago which is that the textbook market is changing rapidly. Last year, at the George Washington Conference on Ethics and Publishing, Dr. Al Greco, Professor of Marketing at Fordham who specializes in the book market, predicted that the market for print textbooks would go from a $4 Billion market in 2012 to $173 million by 2017, about a 95% drop in the next five years. That trend toward digital learning materials combined with the end of what was once a captive customer base forced by geography and proprietary adoption lists to purchase their textbooks from the campus store, has led to an amazing decline in the profitability of college bookstores. This is why, understandably, Len wants out. He saw the coming boom in campus stores back in the Seventies when he bought the chain, and I think he now sees what Al Greco sees. So what does this mean for those of us at an institution with a B&N managed campus store? Well, probably nothing right away, but eventually those concession contracts will come up for renewal, and if what’s left of B&N after Riggio buys back the brick and mortar bookstores is nook and B&N College, well I can’t possibly imagine the nook division wanting anything to do with selling team hoodies, art supplies, and Blue Books. So when those agreements come up for renewal, what should happen? Well, if you’ll indulge me for a minute, I actually have an idea about this. If we could start from scratch with a campus bookstore, what would we want it to do? Well, who are the affected constituents? It would seem students, faculty, and authors. If you’re a student, your answer might include doing something about textbook prices. If you’re a scholar it would probably include access, typically to the most recent scholarship. If you’re a writer, and not surprisingly colleges and universities are filled with those, both in the guise of publishing faculty and paper-writing students, you might want tools and expertise. But above all, I don’t think any of these constituencies wants to see the books go away. Instead, perhaps it’s high time something else left the building, the t-shirts. 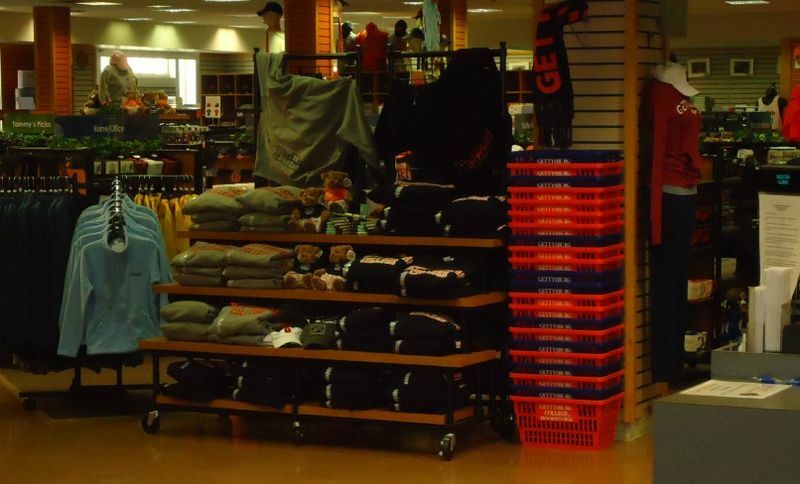 If we are to reimagine the campus bookstore let’s first talk about what it doesn’t need to be. It doesn’t need to be a clothing outlet. Take the shirts and such out of the store and find a new home for it. It shouldn’t be difficult, there are probably already seven or fifteen or thirty other places on and near campus that can handle the distribution of officially licensed goods. Instead, let’s radically recommend that the bookstore handle what it says it does right in the name, books. Next, let’s think about where else on campus books are a focus. Hmmmm. Wait, what’s that across the street? Is that the library? Might it be useful for the library to partner here? Are there efficiencies to be had? They both receive large quantities of books on a daily basis, process those arrivals, and then shelve them for browsing. They both collect course texts for students and distribute them at the request of faculty. They both purchase brand new material for their faculty and graduate students, so that they might have access to the latest scholarship being published. Well, yes, on the surface it does look like there are efficiencies to be had. But could this new kind of campus book place do more than just a bookstore or a library by combining some of what they each do? I think it probably could. So let’s say for a moment that over the weekend I destroyed a giant, evil, purple, crystal Gorgon that had been tormenting a peaceable valley kingdom, and that as a reward for saving them, the people of the kingdom gave me this really cool golden magical wishing sword. (Yeah, I don’t know why they didn’t just use it themselves against the Gorgon, but whatever) So what would I do with it? Well, first I would ask for a million more wishes. It would then, of course, be pointed out to me that’s against magic wishing sword rules. I only get three wishes, and, oh yeah, they can only be used for good. Okay, three wishes, and only for good. Hmm. What good could I do… Wait, how about those students and those high textbook prices? Can I use my magic sword to make things better for them? Well, now that I think about it, yeah, that would be kind of easy. And I might not even need to waste a wish on it. Under the current textbook paradigm, most textbooks are created and sold primarily by those with strong motivations to get the highest possible margin out of the sale those materials. What if we flipped that? What if we brought the librarian ethos to the textbook problem? Should libraries lend textbooks? In some cases that makes excellent sense, but ultimately why couldn’t students be offered both options, purchase or borrow? And if we take the profit incentive out of the retail sale of textbooks, and put librarians in charge of distributing these materials, might librarians have more incentive than B&N to help faculty find lower cost (or free) alternatives to higher priced learning materials? Might they even be willing to help faculty create those materials? Wait, libraries publishing? Who ever heard of such a silly thing? So what else might I wish for that could help people on campus… How about the faculty, how can we help them? What if we offered them all of the latest books in their field at this bookstore? Imagine walking into a campus bookstore and actually finding books there, relevant books. That’s how I’d spend my second wish. Wouldn’t it make more sense for the university for new scholarship to be offered to faculty for browsing before either they or the library purchased it? As a bookstore, this could occur. The practice of returns in the book industry is a problematic one, though one that ebooks and POD are addressing, but in this instance, the ability to return an unwanted book makes a lot of sense. If publisher X University Press (XUP for short) publishes a book about say reliquaries, wouldn’t it make sense for XUP to send a copy to every campus with faculty who would be interested in that topic? If no one on campus needed the book, it could be returned, but if a faculty member wanted to read it, they might really like having the option to either borrow the book, or to purchase it. Either way, the campus bookstore would purchase the book from XUP, and if the faculty member wanted to borrow it, the library would own it after it was returned, and if the faculty member wanted to keep it, the faculty member could pay the bookstore/library for that copy. At which point the bookstore/library could decide if they’d like another copy, or not. I suppose what I’m proposing is a little like the Patron-Driven Acquisitions model that a lot of ebook aggregators and wholesalers are experimenting with, but this would be done with physical books. And like the Lookstore model I wrote about last year, this one might make more sense on a consignment basis, with the onus put on the publishers to find which campuses, or more specifically which departments would be most interested in a new book in a particular field, and then sending the campus stores serving those departments a copy of the relevant book, on consignment for 9 months, after which it is either paid for and shelved, or returned to XUP. Now, I’ve got one more wish left, and the last constituency on campus worth considering when rethinking the campus bookstore is writers—both students and faculty. So how might I use that last wish to help them. Well perhaps the most important thing we can do is keep the store open. Most writers seem to recognize that the recent disappearance of bookstores on the American landscape isn’t really a good development for them. Not only does it reduce the number of outlets where their work can be found, it diminishes book culture and reduces the overall number of commons devoted to books. Beyond just having books available though, I think a better use for some of the space might be for a writing and publishing center. Not only could it offer expertise for students, maybe it could also offer services to faculty. In fact, if libraries are serious about publishing and about Open Access, having a place on campus dedicated to offering publishing services specifically to their own faculty might be a way to ensure faculty are aware of alternatives to commercial publishing, are negotiating the best terms for the content, and using Institutional Depositories. I realize that little if any of this is actually going to happen. I guess it’s the risk one takes when one’s call for reform is entirely dependent on a magical wishing sword. Nonetheless, Gorgon excluded, it probably should happen. I don’t know how many of those almost 700 campuses are going to find themselves without a campus bookstore next year, but I’m finding it hard to imagine a scenario where, like the independents before them, they aren’t going to start to close. When talking about what we’re going to do with those empty book buildings on our campuses, I hope administrators will at least be thinking beyond the concession contract and seriously consider the role that books play in the life and work of their community. Perhaps there’s nothing wrong with textbook prices, perhaps all faculty already see all the new scholarship in their respective fields at conferences, and maybe writing and publishing centers aren’t something campus communities need. Maybe. But it seems much more likely that what most folks on campuses don’t need is another opportunity to purchase a t-shirt. First posted at Content Storage Unit. I would like to point out that before 9pm EDT on May 2nd, this post linked to a service that B&N offered call PubIt, which was a self-publishing platform aimed at both faculty and students for general self-publishing and customized textbooks using B&N distribution. Since I first posted that B&N has redirected that link to their general self-publishing platform and I assume will end the PubIt program. For that reason I removed the original reference to that service in the 2nd to last paragraph. This article is truly a good one it helps new the web people, who are wishing in favor of blogging. introducing it broadly inside the U.S. and U.K. earlier this month. messaging communication (no video and voice yet, these demand a connect-in installing).